A 9-year-old Florida boy got up close and personal with a massive, 9-foot alligator this week, and has lived to tell the harrowing tale. A representative with the St. Cloud Police Department told WFTV that James Barney Jr. was bicycling Thursday when he decided to take a dip in a restricted area of a lake in Osceola County. What was supposed to be an innocent swim soon took a dangerous turn, however, when an enormous gator approached the boy and bit him several times. Witnesses told wildlife officials the gator was 9 feet long, and gator trapper Joseph Elsebough said it weighed between 400 and 500 pounds, WFTV reports. “My son put up a good fight and beat a 9-foot alligator,” he continued. Trappers are still searching for the alligator that attacked Barney, according to the Sentinel. The lake where the attack occurred has reportedly been closed off to swimmers as the search continues, and boaters have also been told to avoid the area so as to not interfere with the search effort. 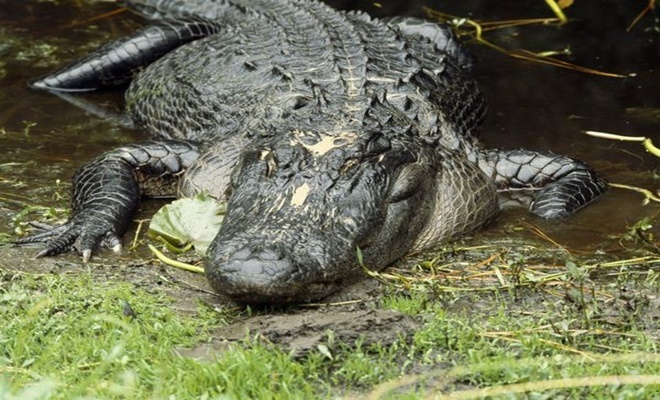 Once captured, the alligator — which trappers say does not seem to have a fear of people – will be relocated, reports News 13. Next articleSinger Turned Politician, 9ice Releases His Political Campaign Photo, Check It Out!